2015 has been an incredibly interesting year from a Google algorithm update standpoint. Although there weren’t many confirmed updates like previous years, it was still a relatively volatile year algo-wise. We had the mobile-friendly algorithm released in April of 2015, Phantom 2 confirmed in early May, and then Panda 4.2 in July. Although those are three confirmed updates by Google, there were absolutely other significant updates that caused significant movement in the SERPs this year. And in my opinion, several of those updates seemed directly connected to “content quality” like Panda and/or Phantom are. Note, Google can roll out hundreds of updates per year, but many of those are minor and do not cause major changes in rankings and/or traffic. 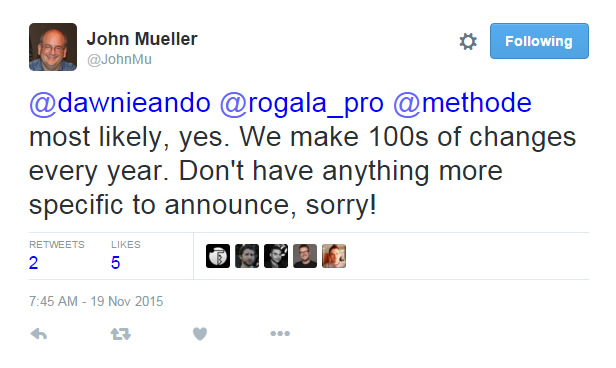 Actually, John Mueller explained that they rolled out over one thousand changes in 2014. It’s important to understand that the updates I’m covering in my post today would be categorized as significant based on major gains or losses of Google organic traffic overnight. For business owners and webmasters, it’s incredibly important to understand the algorithm updates that have impacted a specific domain. I mentioned that in my previous Search Engine Land column about performing a Search History Analysis. If you don’t know what hit you, then you cannot have a solid strategy for attacking those problems and designing the right remediation plan. But if you do have a good understanding of which algorithm updates have caused increases or decreases in traffic, then you can analyze the damage through the lens of the update that impacted the site. And that’s a much stronger way to go for companies looking to recover their Google organic search traffic. I’ll first go through the various unconfirmed updates that have rolled out in 2015 and then explain more about their apparent ties to “content quality”. Again, they definitely seemed connected to Panda and The Quality Update (AKA Phantom 2) based on analyzing many sites that were impacted throughout the year. And if you’re wondering about the November 19 update, I cover that at the end. Based on what I’m seeing, it looks very similar to the others I mention in this post. Let’s begin. It wasn’t long before we saw a significant update in 2015. Specifically, there was a lot of movement on 2/5/15. Based on the large Panda dataset I have access to, as well new companies reaching out to me about a drop in traffic, it was clear there was some connection with “content quality”. Also, many of the sites that were impacted had previously been impacted by Panda. There were many claims throughout the industry of drops or gains in traffic starting on 2/4 and 2/5. Again, it’s important to note that a number of the companies that experienced a large drop on February 5, 2015 had been previously impacted by Panda updates. I saw it time and time again. And although some claimed it was entirely focused on ecommerce sites, that’s definitely not the case. I know many sites outside of ecommerce that were hit too. It’s also important to note that Barry Schwartz reached out to Google to see if it was Panda or Penguin-related and was told that wasn’t the case. So definitely take a hard look at February 5, 2015 if you have experienced a drop in Google organic traffic this year. It very well could have been the 2/5 update, which again, seemed to be heavily focused on content quality. It’s worth noting that RankBrain supposedly started rolling out in early 2015. It doesn’t sound like it had fully rolled out by February, so I’m not sure if it had any impact on the 2/5 update. That said, any algorithm that’s helping Google handle the long tail of search (which is massive), is important to document. Personally, I think the 2/5/15 update had more to do with content quality factors being baked into Google’s core ranking algorithm. More about this soon. I’m including this confirmed major algorithm update in the list since it was originally unconfirmed. Google never intended to release any information about Phantom, but ended up doing so based on the buzz it generated. If you are unfamiliar with Phantom 2, I picked up what looked to be a major algorithm update in late April and early May of 2015 that impacted many sites across the web. And I’m referring to major swings in rankings and traffic. I named the update “Phantom” based on its mysterious nature. You can read more about Phantom in my post containing my findings, but it was a huge update that seemed to target many factors that Panda also targeted. And that got me thinking that Phantom could actually be the beginning of Panda being incorporated into Google’s core ranking algorithm. It’s hard to say if that was the case, or if that could have started during the 2/5 update, but both looked to heavily target content quality issues. The summer brought a confirmed update in Panda 4.2 on July 18, 2015. And it wasn’t pretty, since it was an extended rollout based on “technical problems” Google was having with the algorithm update. Since 7/18/15, many companies have been eagerly checking their reporting to see if P4.2 has impacted their Google organic traffic. Unfortunately, many previous Panda victims (especially those impacted by Panda 4.1 in September 2014 and the 10/24/14 update) are still waiting for recovery. And that’s after making significant changes to their site, content, advertising setup, etc. There was a heavy focus on Panda 4.2 in the industry as we led into the fall of 2015. And that’s when the algo Richter scale in my office started to jump again. Strap yourselves in, the fall of 2015 was a bumpy ride. In early September, I saw significant movement across sites that had been impacted by Panda and Phantom in the past (notice the trend here?) The first date was 9/2/15 and many sites either surged or dropped on that day. Again, these were sites that previously had content quality problems and had dealt with Panda and/or Phantom situations in the past. And it wasn’t long until the next update hit the scene. Exactly two weeks later on 9/16, I saw another update roll through. More sites that had dealt with content quality problems saw movement (either up or down). I wrote a post detailing my findings after analyzing a number of sites impacted by the 9/2 and 9/16 updates. Based on my analysis, it was clear that “content quality” was the focus. So, was it Panda 4.2 continuing its rollout or more core ranking algorithm adjustments like Phantom? Or was it a mix of Panda 4.2 and core ranking algo adjustments? Only Google knows. As I was finalizing this post, it seems that yet another unconfirmed update has been released. There were many claims of movement starting on 11/19/15 from webmasters globally. I am also seeing movement based on the data I have access to, in addition to new companies reaching out to me about the update. So it does look like there was an update pushed last Thursday. When analyzing the sites seeing movement, many of those sites had been previously impacted by Panda and/or Phantom. Once again, the update looks “content quality” related to me and does not look to be connected to links. That said, we are still early on. If this was another unconfirmed update focused on “content quality”, then it joins the others I mentioned in this post that began rolling out in February, continued with Phantom, then in September, and now a late November update. The rapid release of these updates got me thinking about their connection to Panda and what Google has planned for our cute, black and white friend. I have a theory about this and I’ll cover that next. Are The Rapid-fire “Quality Updates” The Deconstruction of Panda? We know that Google intends to bake Panda completely into its core ranking algorithm at some point (and Penguin as well). I mentioned earlier that all of these unconfirmed updates could be Google deconstructing Panda and taking those pieces and baking them into the core ranking algorithm. That could have started with the 2/5 update, continued with Phantom 2 in early May, and then even more with the bi-weekly updates in the fall of 2015, and continued now with the 11/19 update. The summer simply could have been a break from the process as Panda 4.2 rolled out. Note, that is speculation, but data definitely backs this theory. There were a number of algorithm updates focused on “content quality” and we know Google wants to bake Panda into its real-time algorithm. Hard to say if that’s the case, but it’s important to note. As you can guess, this has been extremely frustrating for many business owners dealing with traffic loss from Panda, Phantom, or unconfirmed algorithm updates. Based on helping a number of companies with this situation, I’ve provided a bulleted list below with some recommendations. It is not a comprehensive list of what to do, but can definitely help you get moving in the right direction. Perform a search history analysis, which can help you document the various swings in organic search traffic over time. Then line those dips and surges up with both confirmed and unconfirmed algorithm updates. Understand the content and queries that took a hit. Run a Panda report (which can be used for other algo updates as well) to find the core pages that dropped after a specific date. For quality updates (like Panda, Phantom, and the other updates listed in this post), focus on hunting down low content quality. And as I’ve said before many times, “low quality content” can mean several things. For example, thin content, scraped content, duplicate content, technical problems causing quality issues, advertising problems causing engagement issues, and more. Rectify user engagement issues quickly. Once you find problems causing user engagement issues, fix them as soon as you can. Engagement barriers drive user frustration, which can send those users running back to the SERPs. And low dwell time sends horrible signals back to the mothership. Beware. Avoid user deception at all costs (especially from an advertising standpoint.) Don’t blend ads into your content, don’t surround key elements of the page with ads that can be mistakenly clicked, and don’t provide ad links that look like navigation, but drive users to third party sites. Hell hath no fury like a user scorned. By the way, ad deception is in Google’s Quality Rating Guidelines. You should download the pdf to learn more. Understand how Google sees your site. Use fetch and render to truly understand how Googlebot views your content. I can’t tell you how many times I’ve audited a site and found serious render issues. Fetch and Render is your friend. Use it. 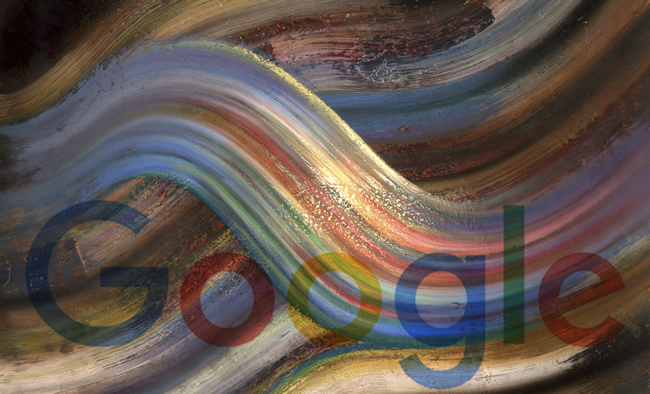 Noindex what needs to be removed and focus Google’s attention on your highest quality content. Make hard decisions. Nuke what needs to be nuked. Be objective and aggressive when needed. Rewrite and revamp content that needs a boost. Not all low quality content needs to be noindexed or nuked. If you feel it’s a strong topic, but the content isn’t the best it can be, then work on enhancing its quality. For example, brainstorm ways to enhance the content data-wise, visually, and based on what users are looking for. You don’t have to nuke it if you can boost it. As you can see, 2015 has been a volatile year from an algorithm update standpoint — yet only a few updates were actually confirmed by Google. In this post, I provided additional important updates that could have impacted your Google organic traffic starting back in February and being released throughout the year. I recommend reviewing your 2015 Google organic trending and identifying any swings in traffic around those important dates. Then form a strong plan of attack for fixing any problems from a content quality standpoint. You have to know what hit you in order to take the appropriate actions. And that’s sometimes hard to do when Google doesn’t confirm specific updates. I hope this post was helpful, at least from that standpoint. Good luck. I have previously written about the power (and danger) of the meta robots tag. It’s one line of code that can keep lower quality pages from being indexed, while also telling the engines to not follow any links on the page (i.e. don’t pass any link signals through to the destination page). That’s helpful when needed, but the meta robots tag can also destroy your SEO if used improperly. 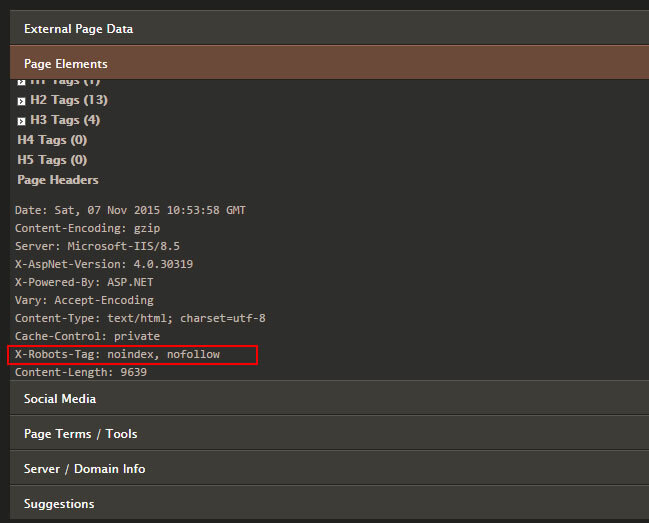 For example, if you mistakenly add the meta robots tag to pages using noindex. If that happens, and if it’s widespread, your pages can start dropping from Google’s index. And when that happens, you can lose rankings for those pages and subsequent traffic. In a worst-case scenario, your organic search traffic can plummet in an almost Panda-like fashion. In other words, it can drop off a cliff. And before you laugh-off that scenario, I can tell you that I’ve seen that happen to companies a number of times during my career. It could be human error, CMS problems, reverting back to an older version of the site, etc. That’s why it’s extremely important to check for the presence of the meta robots tag to ensure the right directives are being used. But here’s the rub. That’s not the only way to issue noindex, nofollow directives. In addition to the meta robots tag, you can also use the x-robots-tag in the header response. By using this approach, you don’t need a meta tag added to each url, and instead, you can supply directives via the server response. Again, those directives are not contained in the html code. They are in the header response, which is invisible to the naked eye. You need to specifically check the header response to see if the x-robots-tag is being used, and which directives are being used. As you can guess, this can easily slip through the cracks unless you are specifically looking for it. Imagine checking a site for the meta robots tag, thinking all is ok when you can’t see it, but the x-robots-tag is being used with “noindex, nofollow” on every url. Not good, to say the least. Based on what I explained above, I decided to write this post to explain four different ways to check for the x-robots-tag. By adding this to your checklist, you can ensure that important directives are correct and that you are noindexing and nofollowing the right pages on your site (and not important ones that drive a lot of traffic from Google and/or Bing). The list below contains browser plugins and online tools for checking single urls, as well as crawling tools for checking urls in bulk. Let’s jump in. The web developer plugin is one of my favorite plugins for checking a number of important items, and it’s available for both Firefox and Chrome. By simply clicking the plugin in your browser, then “Information”, and then selecting “Response Headers”, you can view the http header values for the url at hand. And if the x-robots-tag is being used, you will see the values listed. I use the SEO Site Tools chrome extension often for checking specific SEO elements for a given page. The x-robots directives are somewhat hidden in this plugin, but you can still find them pretty easily. Just click the plugin in Chrome, then select the “Page Elements” tab, and then scroll all the way down to the bottom of the window. You’ll see the header response there, including the x-robots-tag directives if the tag is being used for the page at hand. If you want to check headers on the fly, then there’s no better plugin than LiveHTTPHeaders. It’s available for both Chrome and Firefox and it easily enables you to view the header response for each page as you browse the web. For example, you can check headers and track down problems as you traverse a specific website. 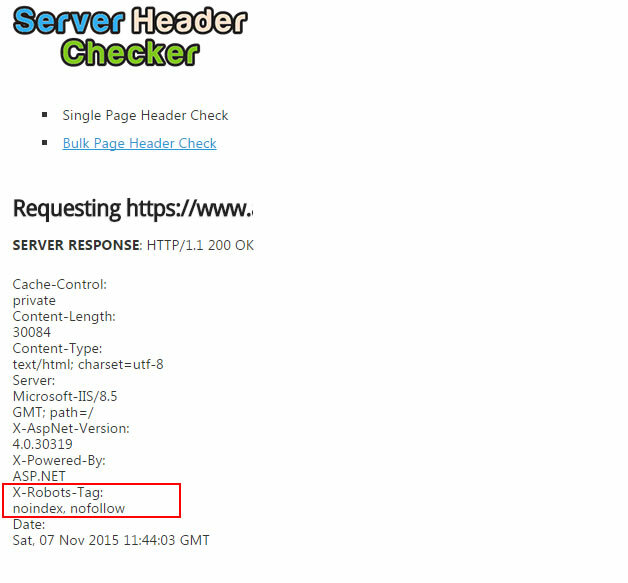 Since it provides the header response for each page, you will also see the x-robots-tag directives for each url. Just click the url you want in the window to view the header response. The x-robots-tag will be listed if it’s used for the url at hand. In addition to plugins, you can use a number of online tools that take a url (or several urls) and return the header response. Like plugins, this is a good option when you are checking single urls or just testing a sample of urls. There are two options when using the SEO Tools Server Header Checker. You can check a single url or you can use the bulk url option to check several urls at one time. For the single url option, just enter a url to test and click “Check Headers”. 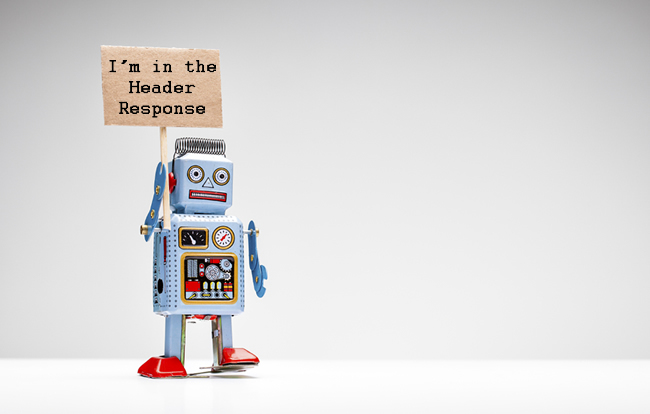 The tool will return the header response for the url at hand, including the x-robots-tag directives. For the bulk header check, enter a series of urls (one on each line) and click “Check Headers”. You will see each response for each of the urls listed, along with the x-robots-tag if it’s being used. 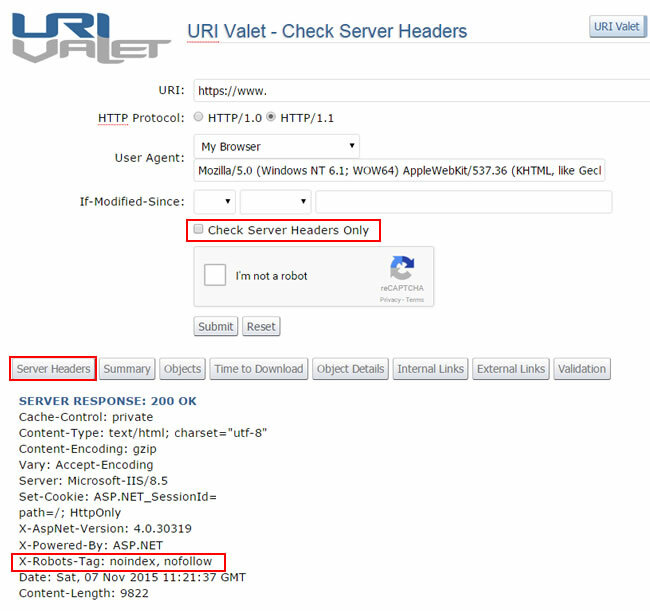 URI Valet is a versatile online tool that returns a number of important pieces of information for the url at hand. For example, the header response, performance information, internal links, external links, validation information, etc. You can also select a user agent for checking the response based on various browsers, devices, and search engine bots. There’s quite a bit of functionality built in to this online tool, but I won’t go into detail about all the reports here. That’s because we are focused on the header response (to find the x-robots-tag). Simply enter the url, select a user-agent (or just keep the default selected), click the “I’m not a robot” button, and then click submit. The header response will be listed below, along with the x-robots-tag directives (if used). Now that I’ve covered some plugins and online tools that can help you check the x-robots-tag, let’s check out some robust crawling tools. For example, if you want to crawl many urls in bulk (like 10K, 100K, or 1M+ pages) to check for the presence of the x-robots-tag, then the following tools can be extremely helpful. 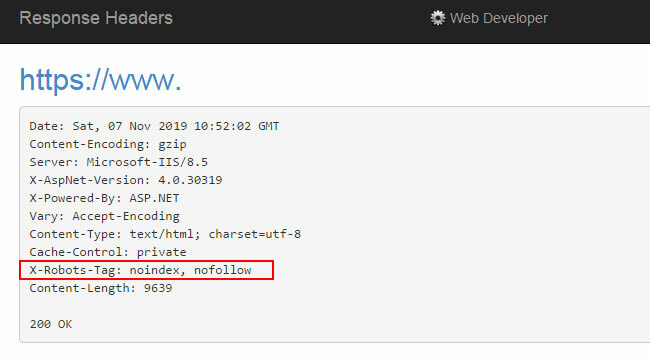 After crawling a site, you can easily check the “Noindex Pages” report to view all pages that are noindexed via the meta robots tag, the x-robots-tag header response, or by using noindex in robots.txt. You can export the list and then filter in Excel to isolate pages noindexed via the x-robots-tag. I’ve also been a big fan of Screaming Frog for a long time. It’s an essential tool in my SEO arsenal and I often use Screaming Frog in combination with DeepCrawl. For example, I might crawl a large-scale site using DeepCrawl and then isolate certain areas for surgical crawls using Screaming Frog. 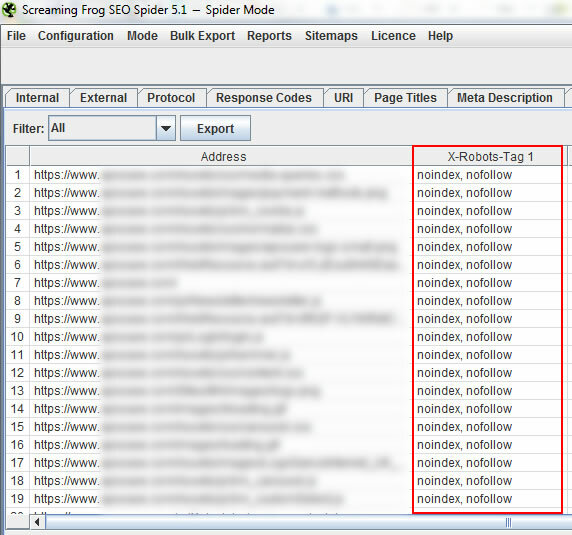 Once you crawl a site using Screaming Frog, you can simply click the Directives tab and then look for the x-robots column. 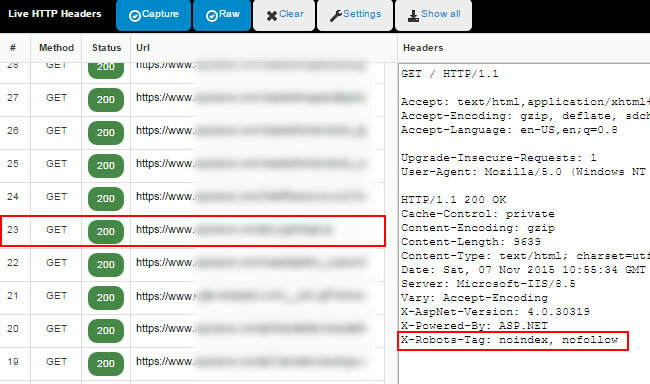 If any pages are using the x-robots-tag, then you will see which directives are being used per url. 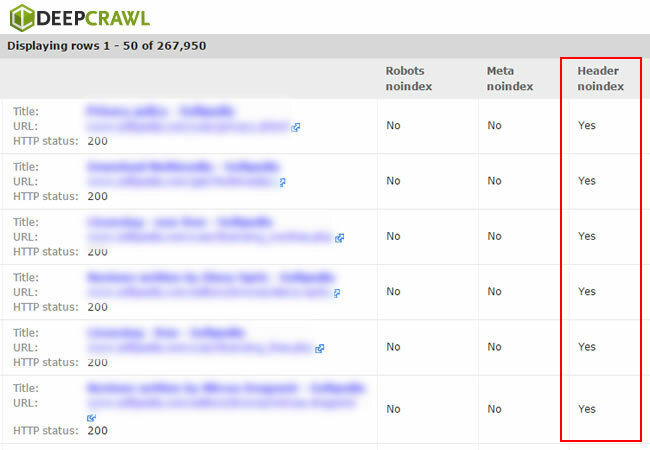 OK, now there’s no excuse for missing the x-robots-tag during an SEO audit. :) If you notice certain pages are not being indexed, yet the meta robots tag isn’t present in the html code, then you should definitely check for the presence of the x-robots-tag. You just might find important pages being noindexed via the header response. And again, it could be a hidden problem that’s causing serious SEO issues. Moving forward, I recommend checking out the various plugins, online tools, and crawlers I listed in this post. All can help you surface important directives that can be impacting your SEO efforts.